It could have been a different outcome had Broch’s Gary Harris not seen his poor penalty kick easily saved by Cove keeper Stuart McKenzie 10 minutes before the interval. Man of the match Megginson said: “It’s nice to start the season with a tap-in after only two minutes. Normally I would have to work hard for my goals but I’ll definitely take that one. “The most important thing was to get the three points. “I felt I could have had a hat-trick had Ryan Christie not stopped my effort with his hand. That should have been a penalty kick. Cove were presented with the championship flag before kick-off with Fraserburgh forming a guard of honour to applaud the champions onto the pitch. 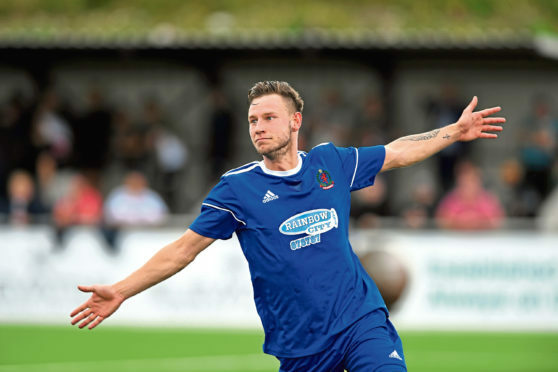 Former Nairn County striker Jordan MacRae was handed his first start for Cove, partnering last season’s Highland League player of the year Megginson in attack. Fraserburgh recalled central defender Ryan Christie and young winger Aidan Combe, who both missed Wednesday night’s IRN-BRU Cup defeat at Inverurie Locos. Only two minutes had elapsed when Cove broke the deadlock. Fraserburgh goalkeeper Peter Tait spilled Daniel Park’s deep cross, gifting Megginson the easiest of finishes as he stabbed the ball over the line from a couple of yards. Fraserburgh were awarded a free kick 25 yards out wide on the left but Harris’s low effort was blocked by Cove’s defensive wall. In the 26th minute Megginson really should have made it 2-0 but on the three occasions he delayed his shot and when it eventually came Ryan Christie had managed to get himself in to position on the line to clear, although Cove claimed he had handled in the process. In the 35th minute the Broch were awarded a penalty kick when Harry Milne bundled over Harris in the box and referee Dan McFarlane immediately pointed to the spot. Harris took the spot kick himself but it was too close to McKenzie who dived to his left to save easily. Cove doubled their advantage in the 64th minute when Connor Scully’s through ball picked out the unmarked Megginson. He advanced and slid the ball past Tait for his second goal of the afternoon. Cove substitute Jordon Brown, making his first appearance since suffering a head injury in a friendly against Aberdeen, had a chance to get on the scoresheet two minutes after taking to the field but hooked the ball well over from six yards out. At the other end a powerful header form Fraserburgh substitute Willie West whizzed past the post. In the 90th minute West was denied by a superb save from McKenzie. Disappointed Fraserburgh captain Christie said: “The penalty we missed was probably the only clear-cut chance we had in the game. “Cove were just a little bit ahead of us today with their sharpness and they fought for every ball. That’s what any side needs to do against a Broch team. COVE RANGERS (4-4-2) – McKenzie 6, Redford 7, Yule 7, Strachan 7, Milne 7, Kelly 7, Park 7, Scully 7, Megginson 8, MacRae 6 (Brown 72), Masson 6. Substitutes not used: Gray, Milne, Emmett, MacLeod. McCafferty. FRASERBURGH (4-4-2) – Tait 6, Dickson 7, Hay 7, Cowie 7, Christie 7, Rae 6, Beagrie 6, Young 6, Harris 6 (West 72), Combe 6 (Campbell 61), Barbour 6. Substitutes not used: Johnston, Buchan, Butcher, Leask. Man of the match – Mitch Megginson.